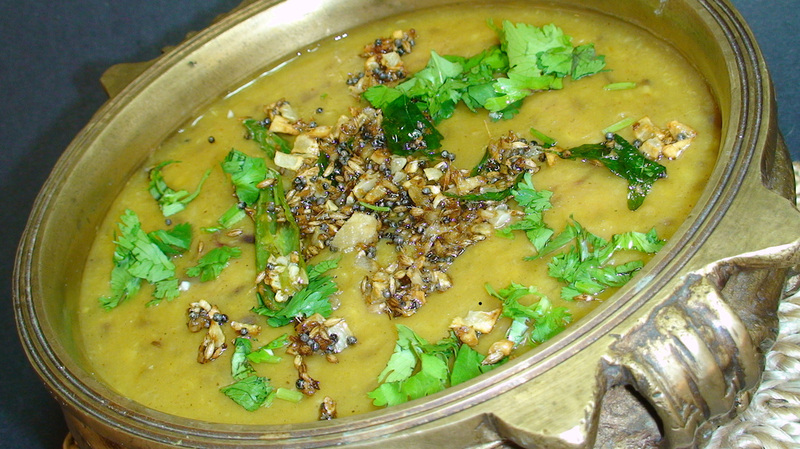 Tadka Dal Fry is a wonderful combination of 3 different lentils (dals). The amazing flavors will have everyone guessing which dal they are enjoying. Blend it well for a smooth texture or leave it as is for a rustic treat. 1. Combine all dals, wash them well and soak for 20-30 minutes. 2. Drain off water and add soaked dals to a pressure cooker. 4. Pressure cook on medium heat for 3 whistles or 3 minutes after full pressure is attained. Remove from heat and do not open pressure cooker until all internal pressure is released. 5. Meanwhile, heat oil in a medium pan on medium heat. 6. Add turmeric powder and asafoetida. 7. Add onions and a little salt and cook until onions are translucent. 8. Add cumin powder, red chili powder, coriander powder and garam masala. Cook for 10-15 seconds. 9. Stir in cooked dal and adjust salt and water to desired consistency. 10. Bring to a boil and cook for 4-5 minutes. 11. Pour dal in a serving dish and set aside. 12. For the tadka (seasoning), heat clarified butter in a small skillet on medium heat. 13. Add mustard seeds and allow them to pop. 14. Add cumin seeds, curry leaves, green chilies, garlic, ginger and cook for 1 minute. 15. Pour seasoning over dal and garnish with cilantro leaves and lime juice. This and more recipes can be found in our book "The Healthy Indian Diet."